This image shows one of Honest Tea's past experiments. Look for the beverage company's stand in D.C. Wednesday. Picture this. You're in downtown D.C. on a hot day and notice a stand piled high with cold iced teas. The stand asks for a donation of $1, but no one is watching. Do you take the drink and run? Or fork over the cash to make sure your conscience rests easy? 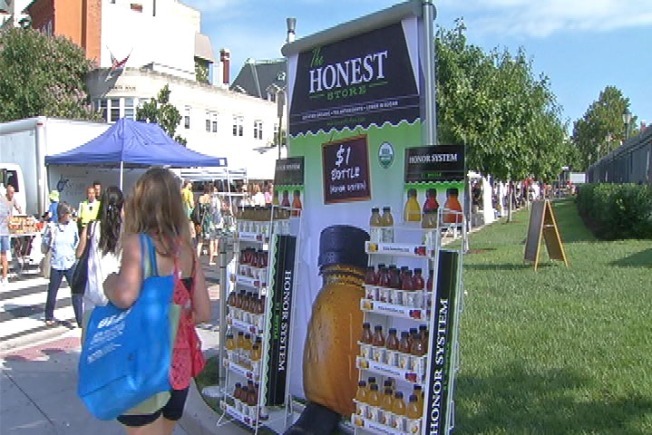 That is the premise behind Honest Tea's annual national honesty experiment. The Bethesda-based beverage company is conducting the social experiment in all 50 states and D.C. on Wednesday to see how honest people are when no one is looking. Unmanned kiosks stocked with bottles of iced tea will be set up next to clear donation boxes asking people to pay $1 for each item on the "honor system." Information about who pays and who steals the tea will be collected to discover which states are the most honest. The national results will be released Aug. 19. The location of the stand is supposed to be a surprise, but we can tell you it's near a busy Red Line station.